Costco may not be the first place that pops into your head when you set out to shop for an engagement ring, but they do have quite a varied selection of them. Just like shopping for anything else at Costco, buying a diamond ring online or in-store can leave you feeling like you just scored a fantastic deal on a quality product. Engagement ring styles from Costco vary from store to store and online, but there is a decent selection overall considering the relatively low number of rings they offer compared to a jewelry store. There aren't many options that include colorful accent stones on the website, though there are some yellow diamonds used as center stones. You can shop online without a membership, but you may be subject to a five percent surcharge. Does the Costco Auto Buying Program Save Money? Shop for modern, vintage-inspired, or unusual rings. You can find everything from a solitaire in a 14K yellow gold band to a brilliant cushion-cut center stone surrounded by 60 smaller diamonds nestled in a platinum band. Some bands (available in yellow gold, white gold, platinum, or rose gold) are simply metal, while others host dozens of small diamonds. Other styles flank the center stone with side stones. Cushion Cut and Round Brilliant 1.00 ctw VS2 Clarity, I Color Diamond Platinum Ring (around $2,500.00). This one has a 4.9-star rating with 35 reviews. It features 61 diamonds total, with a .50 ct center stone. Round Brilliant 1.05 ctw VS2 Clarity, I Color Diamond 18kt Rose Gold Ring. This one is perfect for the woman who wants something a little non-traditional because of the rose gold band. It has a total of 37 diamonds, with a .70 ct center stone. The cost is just under $4,000.00. Cushion Cut 1.00 ct VS2 Clarity, Fancy Yellow Diamond Platinum 1.35 ctw Ring, which features a yellow cushion cut center stone and white baguette sides tones in a yellow gold and platinum band. This ring is about $6,500.00. Though there aren't hundreds of styles to choose from, the variety is definitely there. 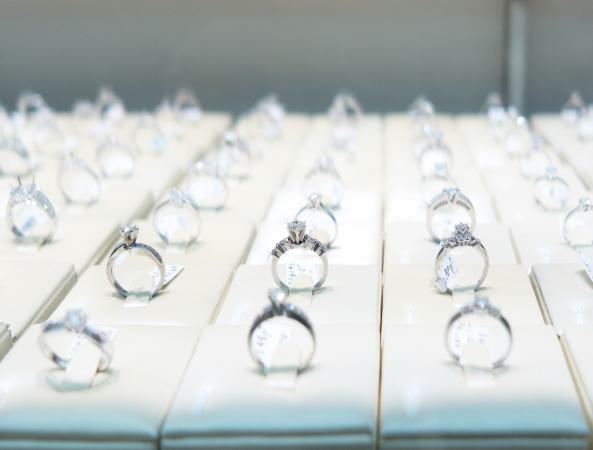 Costco doesn't have the widest range of sizes, but the selection should fit a large percentage of women (according to Blue Nile, the most popular ring size is a six, and most commonly purchased sizes range from five to seven). Sizes at Costco range from five to eight. They seem to carry more in size seven than any other size, but there are a number of fives and sixes, as well as a few eights. 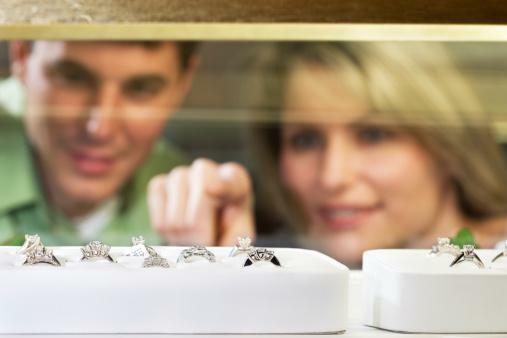 Some styles may be resizable, but you'll need to purchase it first and take it elsewhere to have that done, which puts you on the hook for additional costs not included in the ring's price. Costco engagement rings range in price from about $400.00 to about $34,000.00. Most of them, however, are in the $2000.00 to $10,000.00 range. If you can't shop in the store with the help of a sales associate, the website makes it easy to find the rings in your price range. You can either list all styles by price from low to high or high to low, or just select acceptable ranges on the left side of the Costco page to filter your results. Costco does allow returns on unused, unworn jewelry items if you are not satisfied with your purchase. You'll need to have your GIA or IGA report along with your return. Rings may be returned in store, or you can email your return information to Costco and they will arrange for a UPS pick up for the return. If the ring is over 1.00 carat, it will be sent to the fulfillment center for verification before the refund is issued. You'll need to include your reason for the return as well along with your name, confirmation number, phone number, and whether or not the credit card used for purchasing is still active. At first glance at the ratings, the customers seem to feel like they've gotten a good deal, but sites like Diamonds Pro and Beyond 4Cs are less impressed. The Diamonds Pro article points out the lack of a Gemological Institute of America (GIA) certificate with purchase, and the diamond purchased - though well-cut and in a beautiful, quality setting - was of lower quality than the site claimed. Once the discrepancies in the information Costco provided came into play, the quality versus cost benefit to shopping at Costco evaporated. It's worth noting that some of the diamonds do, however, come with a GIA certificate. Why the difference in quality? As Beyond 4Cs points out, Costco now uses the Industry Grading Guide, not necessarily the stricter standards of the GIA and American Gem Society. Beyond 4Cs compares the cut of the Costco diamonds to what you can get from other online vendors and concludes that shoppers pay up to 30 percent more at Costco. You can filter results based on quality and color of the stones. You may find that all listings have the VS2 clarity, so there might not be much wiggle room there. However, you can choose between Near Colorless (G), Near Colorless (I), Nearly Colorless, and Fancy Yellow, according to the industry grading scale. No single style has hundreds of reviews to sift through to look for clues as to how the ring will look in person, how it matches up to the picture, or how it wears over time. Most styles have fewer than 40 reviews. However, customers who have taken time to write out their thoughts for others to use when making their decision have been mostly pleased with their purchases. Most styles have between 4.0 and 5.0 stars (on a 5.0-star scale). A handful of styles fall below that, and some styles have yet to receive any reviews. Many of the rave reviews say the pictures don't do the rings justice, and that the rings are worth more than they paid for them. Negative reviews were few and far between, but some customers reported a center stone that was yellower than surrounding stones, a small missing diamond, and a band that split after a week. With some comparisons of your own once you've decided on the style of ring and diamond quality that you want to purchase, you'll be able to decide if Costco has the best deal for you and your soon-to-be fiancée. Pay special attention to which certificates are available with the rings you're interested in to ensure that you're getting what you're paying for. You may find the perfect ring at an unbeatable price online or in-store at Costco.